This year’s kindergarten has taken an even larger step into nature by creating a daily rhythm that is held primarily outside. 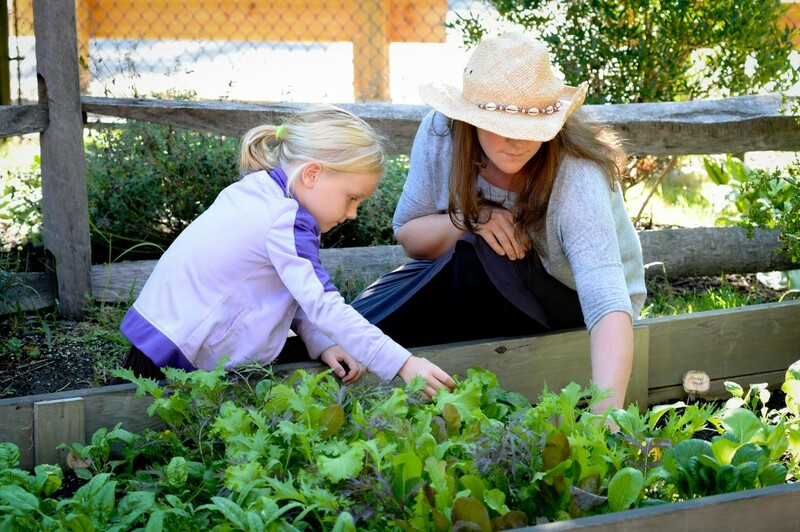 While indoor work and play remain a part of the curriculum, our meals and circle time have been brought outdoors, and we have added a nature walk and extra time for gardening to our outdoor routine. 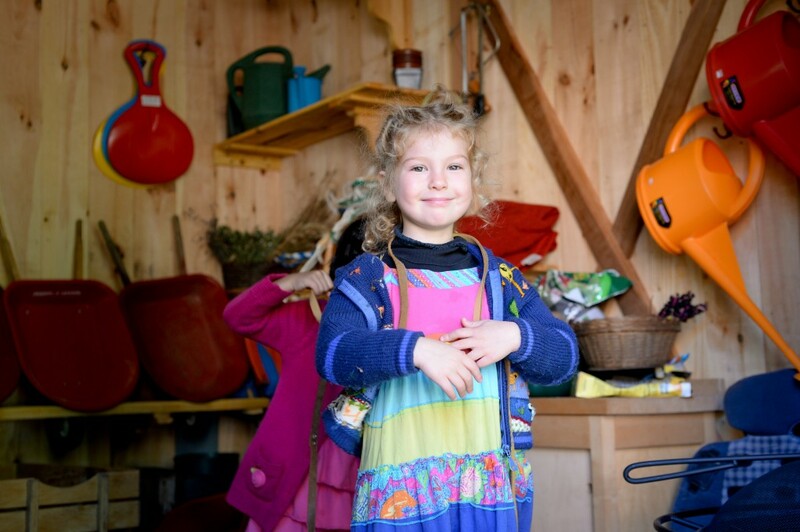 With work in the social realm being so prominent in the Waldorf Kindergarten, what better place to foster these lessons than the natural world around us? Gathering together and sharing a meal is an important part of the Kindergarten curriculum (photo J. Benoit). The children take part in preparing the snack and setting the snack table, and they take turns serving their friends. This year we are eating more food harvested from our very own gardens. To prepare for the day, the children begin indoors in our newly designed two-room classroom. In the larger room, everyone is bathed in sunlight as we chop apples, prepare the basket for our nature walk, fill our canisters with dried teas and other supplies, water plants and otherwise tend to the important chores of everyday life. Play goes on simultaneously, with the children tending to babies, creating fairy and gnome villages and building elaborate creations out of large wooden blocks. In our smaller room, there are two tables for indoor activities such as painting, bread making and coloring. As the children grow accustomed to the rhythm of our weeks, they know which activities to help prepare for each day. Our smaller room is also a welcoming place for quieter play, and some children naturally make their way there through the new ‘hidden’ corridor (built over the summer) even when they are not helping teachers with our work. From here we are quickly off for our day outside, setting off on our nature walk. We are headed to the field for apple snack and circle time, but the walk is more than just a means to a destination. While walking, the children experience singing and quiet, talking and listening, holding hands gently and running vigorously up and down our varying terrain, all under the embrace of Mother Nature’s changing ways – we already feel the changing sun and cooling temperatures, and look forward to snow, rain, and wind! Through the year we will expand our nature walks to include more of our Moraine Farm campus, taking walks to the “Elephant Tree,” to our land by the water and to the farm to name a few destinations. On Fridays, our walk includes the gathering of kindling for the soup fire. Once at our destination, these same changing weather conditions embrace us for apple snack and circle. This year, we open our circle as we always have, saying, “Here is the earth, here is the sky, here are my friends and here am I!” — only now we are truly stomping on the earth and reaching up to the varying colors of the sky! Returning through the woods to school, we remain outdoors to enjoy free play and the practical work of our gardens and playground. Some children run right off to the climbing structure while others enter the cabin to pull out horse reins or shovels (photo below). Others join Mrs. Sappia to finalize preparations for our meal or outdoor table activities, and yet others gather with me to tend the gardens. Right now, we have several gardens to tend! There is our Tea Garden where the children cut mint and chamomile for our daily tea; the Soup Garden where the children harvest garlic and herbs for our soup and recently planted more garlic and cold weather crops; and our Green Garden where the children pick various lettuces for our Mexican salad we have on Beans and Rice Day, spinach and mustard greens for sauteing on millet day, and arugula that we have made into pesto. Our Living Teepee garden is surrounded by rocks harvested from the Moraine Farm CSA and right now the teepee is decorated with corn stalks and hay bales generously donated by one of our families. We also have beans growing slowly up the walls, and in spring we will plant peas. As the teachers focus on meaningful work, the children join with us, chopping vegetables for soup, chopping fruit for fruit salad, and even making fresh salsa with the recent abundance of tomatoes from our CSA share. Also on the tables outside we work with different fibers — wet felting, plant dying and making salves from the calendula we have grown. Each Friday, we bring out our fire pit to cook the soup. Fire is a fulfilling element for the children, and bringing it into the center of our sand box seems to instill a reverent mood; even before a match is struck, play quiets down as the kindling is brought and Mrs. Sappia makes final preparations for the fire. The nursery children soon will be joining us for Friday soup, bringing with them a meaningful experience of sharing – they will bring their bread to share with us just as we will share our soup with them. We will all eat together outside on our picnic tables, expanding the reach of our community, and delving into new social interactions and responsibility. With fall temperatures coming, we will soon have a cider press going to make fresh cider and we will harvest apples to make fresh applesauce. As the winter creeps in we will work even more with wood and woodworking projects like houses for owls to nest, and when winter turns towards spring, we will tap trees to make our own maple syrup. The sap will bubble away on our fire pit. In spring we will begin working in the earth again creating new garden spaces and sewing seeds for flowers, herbs and vegetables. As part of our weekly rhythm we will be making yogurt and butter for our snacks from the cows’ milk from Appleton Farms. The festivals will continue to weave their way into our days through stories and circles and with seasonal activities such as plant dying silks, construction of lanterns for our lantern walk, and the making of natural crowns for May Fair. On days when the weather allows we have snack outside in a warm little nook where our two new picnic tables rest. The children help to set the table and we light lanterns as we have our “golden moment,” a special time of quiet eating that is honored by the children. On days where we need to be inside for snack, the children are quite happy to revisit their rooms. So far, millet day has become a favorite for the students with them even asking for seconds of our sautéd Moraine Farm greens. In addition to Kindergarten teacher, Lindsay Miles is the current chair of our Early Childhood faculty. She is also mom to a fourth grader at our school and has young twins at home. She can be reached at LMiles@waldorfmoraine.org.